As the female hormone estrogen starts to rise after menstruation and peaks around mid-cycle (ovulation). It then rapidly drops only to slowly rise and then fall again in the time before menstruation. Estrogen holds fluid and with increasing estrogen comes fluid retention: many women report weight gains of up to five pounds premenstrually. 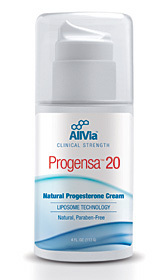 Bioidentical progesterone cream curbs hormonal imbalances associated with premenstrual syndrome, by balancing out the increasing levels of estrogen with bioidentical progesterone. Beyond the treatment of liver disorders, everyday care of the liver lays a cornerstone for total body health. Naturopaths and others who look beneath the symptoms of an illness to its underlying cause, often discover that the liver has had a role to play. This is true across a vast range of different ailments from headaches to PMS. If a woman has been on birth control or taken pharmaceutical drugs it is likely that her liver is not metabolizing estrogen leaving her with an abundance of estrogen which will heighten her premenstrual syndrome.